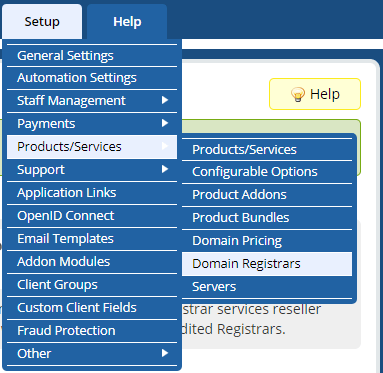 One of my client gave a task of installing and integrating OpenSRS Domains Pro with WHMCS. Below are the steps to be followed. Download the latest version of OpenSRS Pro WHMCS module from here and extract it. The extracted directory would contain WHMCS directory under which you will find sub-directories such as Includes, lang and modules. In WHMCS root directory, you will find the corresponding directories Includes, lang and modules. Upload the files of OpenSRS Pro to WHMCS maintaining the folder structure. Do not replace the directories as it would contain many other files of WHMCS application. So only upload the files of OpenSRS pro to the corresponding directories. Scroll below to find OpenSRS Pro and click on Activate button. You need to get/generate an API key for your reseller account, as well as whitelist your server’s OUTBOUND IP address to access your account. Copy your API Key if it was already generated, else click on Generate New API Key button. Under IP Access Rules, Click on Edit link to white-list your server’s IP. Enter your server’s OUTBOUND IP address as shown in the above image and click on Add button. If you need to white-list a range of IP’s, then you can use CIDR notation choosing the appropriate prefix from drop-down menu. Allow up to 60 minutes for your IP address to be fully white-listed by the system. Also for shared hosting, speak with the server administrator to determine the correct address/range that needs to be white-listed. Provide the relevant information of your OpenSRS Account and the API Keys obtained from the above step and click on Save Changes button. 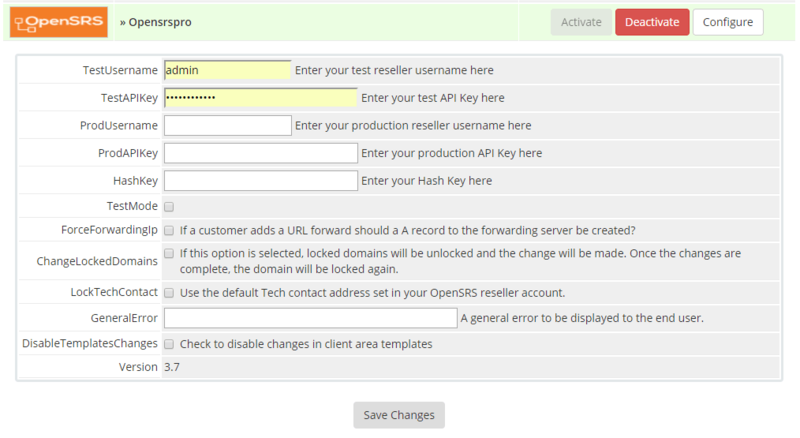 Navigate to manage.test.opensrs.com and obtain Test API Key. Hash Key: A Random string of characters. This is used to create strong passwords when provisioning domains and should never be changed once it is set as it is used to access previously registered domains. This is an optional field. The rest of the options are optional and can be activated as needed. 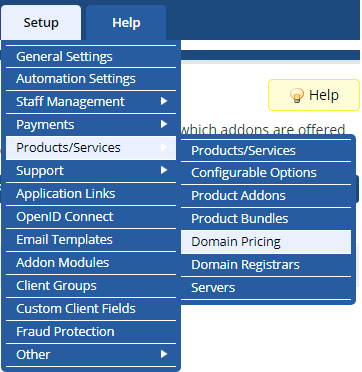 Navigate to Setup -> Products/Services -> Domain Pricing in WHMCS. Click on Open Pricing for a particular TLD and set price. The above steps were tested with OpenSRS version 3.7.1 and compatible with WHMCS version 7.1.